A new study conducted by consultancy CE Delft for four European NGOs finds that practically all households in the EU can play a role in the transition. Craig Morris takes a look. Released in September (PDF), the study focuses on what citizens can do with wind, solar, and demand management (including storage) by 2030 and 2050 – at home, in community groups, in the public sector, and in small businesses. The main finding is that 83 percent of European households could eventually become “energy citizens” (the paper’s term for what is usually called “prosumers.”) Nearly two thirds of them, so roughly half of all households, could make their own energy. 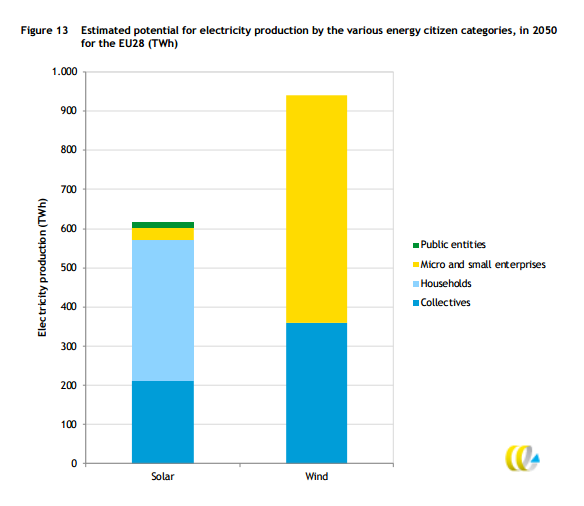 In this scenario (which is available as a spreadsheet in the report’s Annex), the EU would be 100% renewable for all of its energy – not just electricity. Interestingly, the study implicitly (unfortunately not explicitly – but that’s what I’m here for) says that Europe has more space for PV than it needs. Specifically, the potential of rooftop PV had to be reduced based on the “total capacity solar PV capacity needed according to the Energy Revolutions scenario” published by Greenpeace. The study assumes that the number of cars will stay the same by 2050 (probably unrealistic if we get self-driving vehicles and car ownership plummets), giving us 115 million households with an EV (just over half of 210 million). These cars would be charged largely when the grid has excess green power. While the press croons over battery storage, smart electric boilers turn out to have greater potential for dissemination. While 42 million households (20 percent) might have stationary batteries, 70 million might have smart water boilers – even more than the 60 million expected to have solar on their roofs. Yet, practically no one (outside of Denmark and community energy campaigners in Germany) is even talking about smart water boilers. 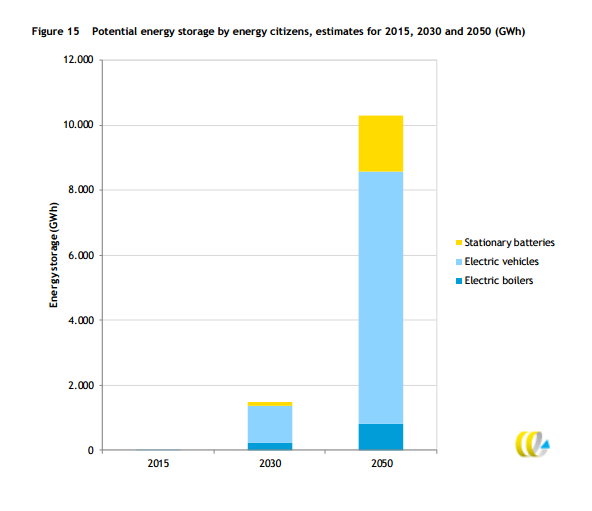 Stated in terms of the energy amount (see Fig 15 below), EVs clearly have the greatest storage potential by 2050, and the role of stationary batteries becomes much bigger than that of electric boilers. This finding runs contrary to previous German studies (such as IWES’s), which found that stationary batteries will mainly be used to store and release small amounts of power for brief periods (ancillary services), not store large amounts for a long time (arbitration). 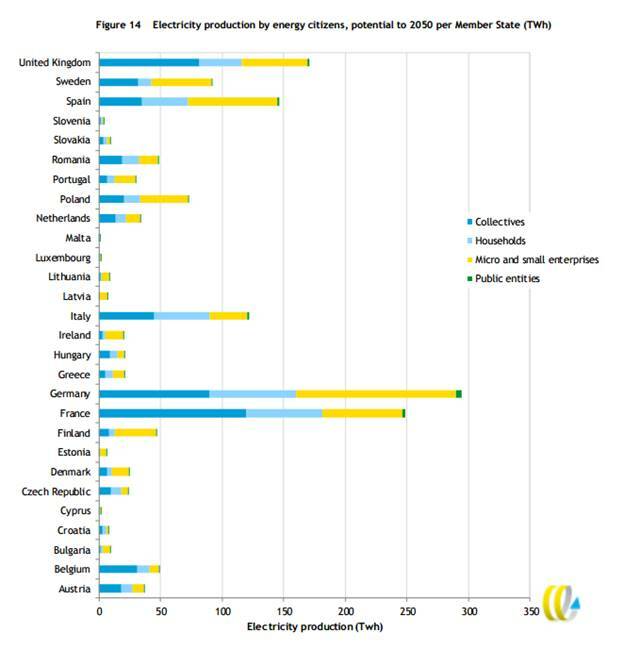 The situation may, however, be different in southern Europe, where more solar is available and less heat in needed than in Germany. The main takeaway from the study is that energy citizens can play a central role, not a marginal one, in our energy supply. We are talking about roughly half of our electricity alone, with the other half left up to all of the utilities – municipal and corporate – that today cover nearly 100% of power supply in most countries. The EU now says it aims to focus on the “active participation of citizens and local communities in the supply and demand of electricity,” as Euractiv quotes one official. The report certainly suggests that the potential is great. One wonders, though, whether officials in Brussels will have the stamina to stick with community energy once it becomes clear that the big energy firms that have pushed the concept of an integrated European market (and opposed renewables) would be sidelined in the process. There is a certaint seasonal production asymmetry between PV & wind. If a large number/most HH roofs had PV you would have some over production problems – in summer possibly solved by storage in houses that do not have roof orientations that are OK & implementation of local energy “markets”. Local wind would take over in autumn/winter/spring – I’m guessing 1MW+ WTs. Next PostThere are no people backing Florida’s deceptive solar amendment. Only corporations.